alone, as of last week. Many app developers are recognizing the opportunity to develop on Android, including PrivacyStar, a small privacy services company offering smartphone users the ability to block unwanted calls from telemarketers via their mobile app. 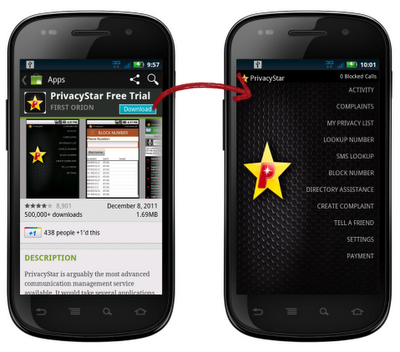 To help grow their business on Android, PrivacyStar looked to AdMob to drive quality downloads of their app. PrivacyStar had used a variety of marketing channels to promote their app, including desktop display and television advertising. While successful, this initial acquisition strategy resulted in relatively high cost-per-acquisition (CPA), with downloads costing upwards of $5. Seeing the need to reach their audience while on specific smartphone devices and slash CPA, the PrivacyStar team decided to try in-app advertising across a number of mobile ad networks to drive users to download their app directly to their devices. AdMob was able to deliver and quickly become their most effective channel of advertising. Other mobile ad networks struggled to maintain a low CPA as they grew on Android inventory. The team then began optimizing their advertising within other mobile apps on the AdMob network—informed by data from Google Analytics. App placements were limited to particular app categories to focus their audience and placements that didn’t meet the aggressive CPM targets were excluded. Within a month of these optimizations, cost per acquisition fell to less than $2, a fraction of their initial acquisition cost. Additionally, the quality of downloads that AdMob drove were far superior, with more users upgrading to a monthly subscription. The success that PrivacyStar has achieved with AdMob and Google Analytics has them poised for continued growth on Android. For more details on PrivacyStar’s approach, check out the full case study. With the rapid smartphone growth, it’s no surprise that consumers are downloading a huge number of apps--10 billion on Android alone, as of last week. Many app developers are recognizing the opportunity to develop on Android, including PrivacyStar, a small privacy services company offering smartphone users the ability to block unwanted calls from telemarketers via their mobile app. To help grow their business on Android, PrivacyStar looked to AdMob to drive quality downloads of their app.